You are here: Home / News / The Senate Must Pass Background Check Bill. The Senate Must Pass Background Check Bill. (ThyBlackMan.com) Defenders of the status quo – advocates of the gun industry & the politicians paid to defend it – will tell you that events like these are virtual acts of nature, products of mental illness or bad parenting, beyond our ability to control. This couldn’t be further from the truth. Every day we fail to take action, we chose this fate. We tolerate politicians who fail to acknowledge this crisis and vote against our safety. We let our gun violence epidemic continue day after deadly day. – Former U.S. Rep. Gabby Giffords, responding to the February 2018 mass shooting at Marjorie Stoneman Douglas High School in Parkland, Florida. A policy supported by 92 percent of American voters has just come before the United States Senate. It’s supported by 89 percent of Republicans and 95 percent of Democrats. But, because it’s opposed by 100 percent of gun industry lobbyists, it will be a fight to pass it. H.R. 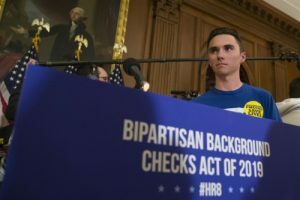 8, The Bipartisan Background Checks Act of 2019, is the most significant gun safety bill approved by the U.S. House of Representatives in more than two decades. The legislation requires background checks on all firearm sales in the country. Currently, only licensed dealers are required to conduct background checks on firearm purchasers. Timing of the bill was especially significant for freshman U.S. Rep. Lucy McBath of Georgia. This month would have marked the 24th birthday of her son, Jordan Davis. He was 17 when he was fatally shot by a man who opened fire on a car of unarmed teenage boys at a gas station in Jacksonville, Florida, in 2012. More than 2,400 Americans have died in gun-related violence so far in 2019, an average of about 37 people per day, according to the Gun Violence Archive. Almost 480 children and teenagers have been killed or injured by guns this year. Background checks have stopped more than 3 million illegal gun sales since 1994, according to the Department of Justice. But anyone who is not legally permitted to purchase a gun easily can acquire one at gun show, though an online seller or via a person-to-person “private” sale. An investigation by the firearm safety organization Mayors Against Illegal Guns found that people who bought guns from the online seller Armslist.com were nearly four times as likely to have a criminal record that would prevent them from passing a background check. Approximately one in five guns is sold in an unregulated transaction, and 80% of all firearms acquired for criminal purposes are bought through unlicensed sellers, according to the Center for Gun Policy and Research at Johns Hopkins Bloomberg School of Public Health. No one argues that universal background checks alone can end the epidemic of gun violence. But it can restrict the illegal gun market. In states where private sales are regulated, there is less flow of guns from legal owners to criminals. If the Senate fails to pass H.R. 8, it will be placing the financial interests of the gun industry above the interests of everyday Americans, including gun owners, who simply want to keep their families safe. Please call your Senators at (202) 224-3121 and tell them to vote to make America safer.